Location: Old Keig, Aberdeenshire, Scotland. Grid Reference: 57° 15' 48.7" N, 2° 40' 5.51" W.
Old Keig: (Recumbent Stone Circle). The largest recumbent stone in Scotland. This monument was built on a the crest of a ridge in such a way that the immense recumbent stone 'frames' the path of the moon over its full 18.6 year cycle. Old Keig: (Auld Keig, The Old Kirk, O'Keig). 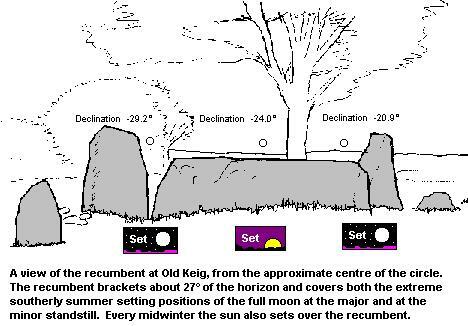 At Old Keig the recumbent stone circle is found situated on a slight crest on a ridge, and within a narrow windbelt. The recumbent stone, 16ft long on top, 6ft thick, 6 3/4ft high, two flankers, the westerly 5 1/4ft above the turf, the easterly 9 1/2ft, and a third orthostat, 9 1/2ft high, to the east, survive. Five other earth fast stones in the vicinity look as if they have been disturbed. Excavations by Childe in 1932-33 revealed a bank of large stones, just under the turf in front of the recumbent and E flanker, extending for 7 ft towards the centre of the circle. The remains of an eccentrically placed ring cairn, which had been disturbed by operations in 1692, were uncovered. They comprised a kerb of large stones 15ins to 24ins, long forming a very rough semi-circle about 30 feet diameter, containing a disorderly collection of boulders. 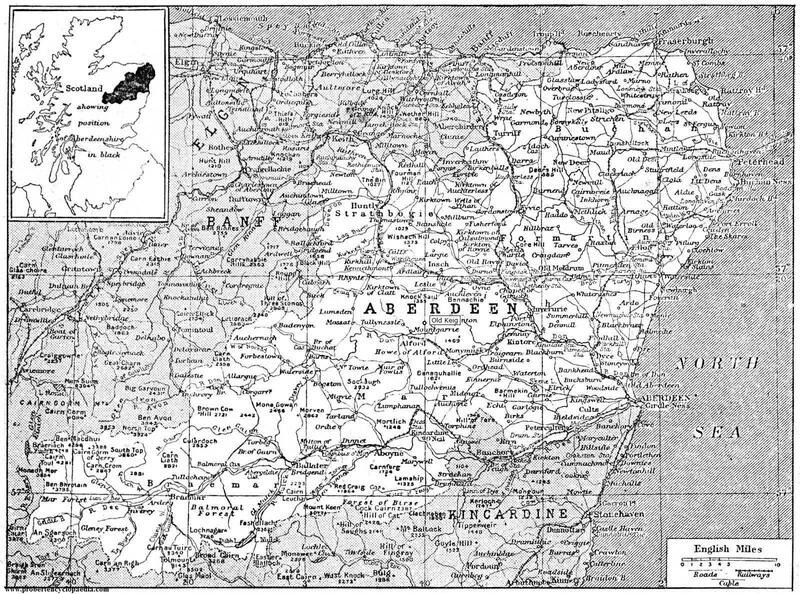 As a result 'flat-rimmed' pottery found during the excavations Childe's dated the monument to the Late Bronze/Early Iron Age but this view was challenged by Kilbride-Jones (1935) who regarded the pottery as secondary, and the very few beaker sherds, including one with burning-bone comb impressions, as presumably primary. Finds, presented to the National Museum of Antiquities of Scotland (NMAS), included beaker potsherds, charcoal, minute fragments of cremated human bones and portions of three or more large flat-rimmed urns. Surveyed at 1/2500. Visited by OS (RL) 12 September 1968. This monument is situated in a grassy shelterbelt on the crest of a ridge at an altitude of 210m OD. The ground falls away on all sides and there is an open aspect to the S. The massive recumbent stone and flankers are its most impressive feature, there being little trace of any internal features. It has been tidied up since 1975 (the hole under the recumbent being filled with loose stones) and there are four small trees in the bank. NMRS, MS/712/50, visited 20 May 1978. At once communal and anonymous, the essentially Neolithic nature of the recumbent stone circle is perhaps nowhere better seen than at Old Keig where the circle, 20m in diameter, is now represented by a gigantic recumbent of sillimanite gneiss, two flankers and one other stone, standing on a low bank. 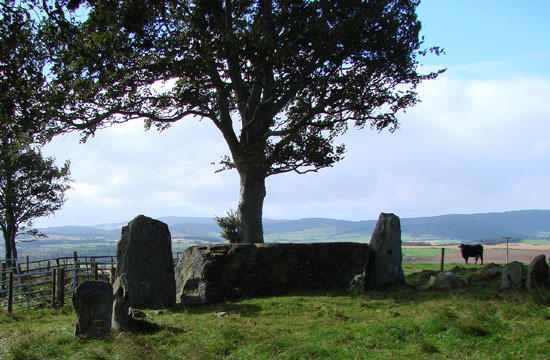 The circle is located on a very slight crest on rising ground with distant, sometimes magical, views over the Howe of Alford. The site was probably levelled and the enormous recumbent, which weighs 53 tons and is the largest known (4.9m by 2.1m by 2.0m) dragged from somewhere in the Don valley about 10km away. The last 1km would have been uphill at a gradient of 1:14, requiring well over 100 people. Prior to the building of the eccentrically-placed ring cairn, a small timber structure (similar to that at Loanhead of Daviot, NJ72NW 1) may have stood for a short time in the central area. Scheduled as Old Keig, stone circle. This stone circle site is special because the recumbent stone here is the largest known. It measures 5 metres long by two metres wide and two metres deep, and weighs all of 53 tons. Although the top surface was smoothed almost perfectly flat and horizontal, the underside was fashioned into a 'keel', a common Neolithic design feature used to keep large stones upright. Archaeo-astronomy: The recumbent was placed so that the midwinter sun sets over it (as seen from the centre of the circle). In addition, during the major standstill every 18.6 years the midsummer full moon sets over the left side of the recumbent; while at the minor standstill the midsummer full moon sets over the right side of the recumbent. The combination of purposeful locations, recumbent stone alignment and the Northerly latitude permit these monuments to precisely interact with a celestial phenomenon, which can be observed every eighteen years, resulting in the moon appearing behind one flanker, rolling across the recumbent and disappearing behind the other flanker. The creation of this effect clearly played a major part in the design of these monuments. The precise physical positioning of the circle was of great importance, as shown by the fact that, in the case of Old Keig, the large granite recumbent was dragged an estimated 10km uphill to the site.